produced 1675. Museum of London collection. Firefighting has an interesting history and the history of firefighting in Lambton County is no exception. Fire has historically posed a major threat to developing towns and cities around the world. Infamous damage occurred in England when the Great Fire of London raged from September 2 to 5 in 1666, destroying an estimated 13,200 homes and 87 churches. 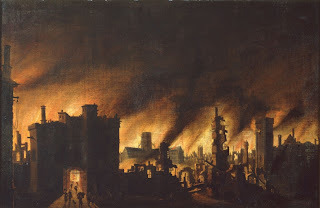 Fires were devastatingly common in early towns and cities, which were vulnerable because of over-crowding, many wooden structures, and the fact that so many daily activities (cooking, heating, lighting) involved open flames. Frequent fires eventually urged the establishment of formal firefighting organizations. However, prior to the formal fire departments, towns and cities often depended on volunteer operations. 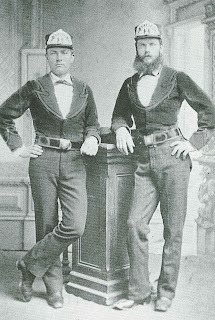 of the Beaver Hose Company, April 1878. The first fire department in Sarnia was organized in the mid-1850s but it was poorly supported. A volunteer operation, Sarnia's first firefighters did not have proper equipment until town council purchased a hand drawn fire engine in 1859. Even with the new equipment, criticisms arose when the fire department did not arrive on scene in a timely manner. To combat the tardiness, financial incentives were offered to the first firefighters arriving on scene. Competing fire companies developed in Sarnia, and the first fire company to arrive at the scene of a fire was the only company to get paid! The Beaver Hose Company was one of these competing fire companies, and they were known for their fast responses. On July 6, 1912 the fire department became an official town department and service was standardized in Sarnia. Horses would continue to draw fire engines until the first trucks were introduced in the 1920s. More details about the history of the Sarnia Fire Department can be found on the City of Sarnia's website. Some parts of Lambton County faced special threats due to oil activities. Fires in the oil fields could be very frightening and fierce. When fires occurred during the great oil boom in Oil Springs in the 1860s (see the Oil Springs Boom and Bust page on the Oil Museum of Canada's website for more details), witnesses reported that flames raged on the waters of the Black Creek, where overflow product had trickled from the oil fields. Petrolia also had to contend with some dicey situations as local refineries caught flame. 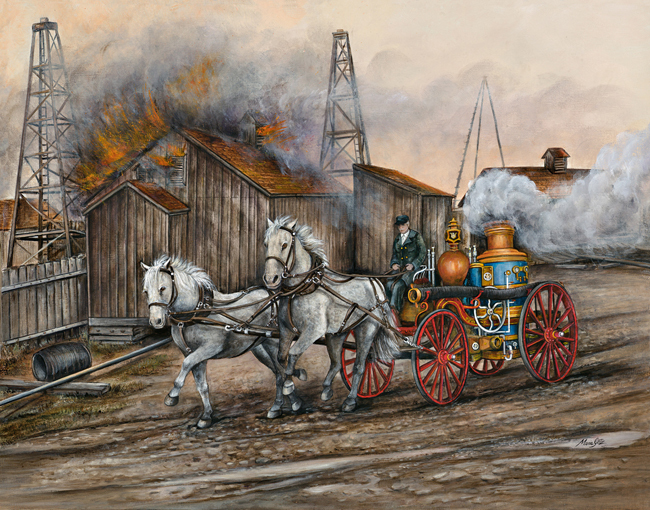 To read more about the Reliable Fire Company in Petrolia and learn about a special print currently on sale at the Lambton Heritage Museum, visit the Lambton Heritage Museum's Information Page on The Reliable to the Rescue print.